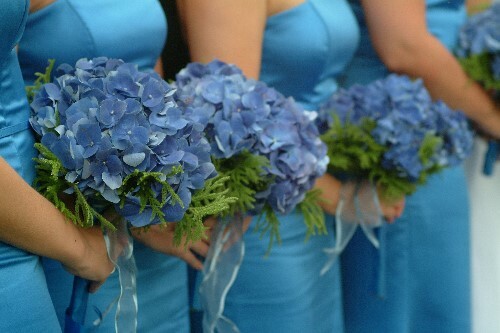 Blue wedding flowers are becoming increasingly popular. 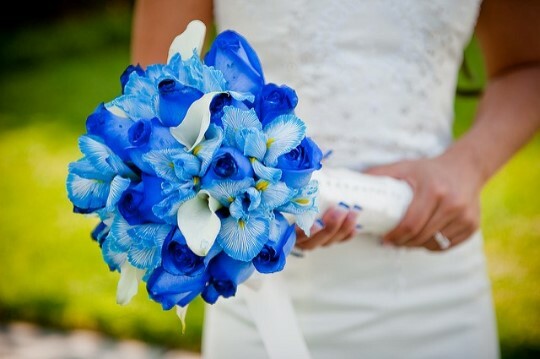 Blue is a lovely color to include in your wedding scheme. 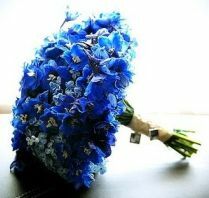 Blue represent sincerity and faithfulness. 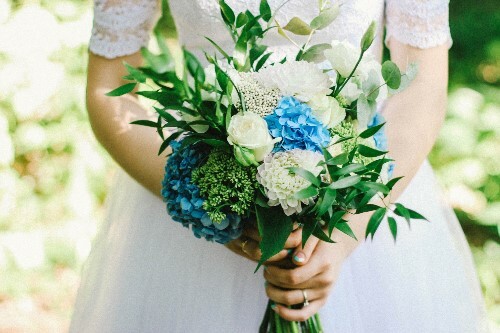 If you have already decided to use blue as a wedding color and you want your wedding flowers to match you will need to decide how important the cost of these flowers are. 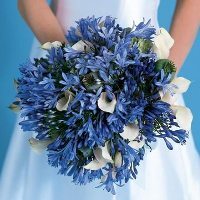 There are blue flowers that are by season and some that are year round so you will not have a major issue with finding pretty blue flowers for your bouquets or centerpieces, however if you choose to use a flower which is out of season instead of one which is year round it could cost you more. 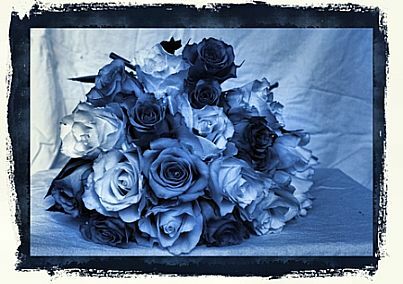 Tinting roses a different shade is always a popular option as roses are beautiful and available all year long. 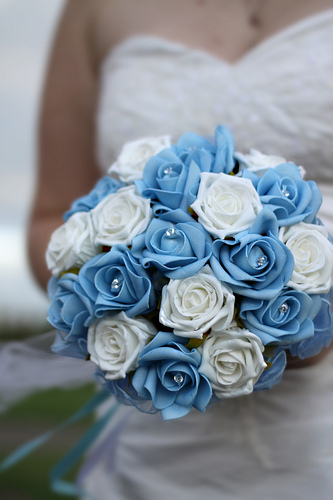 If you are in love with the idea of using roses and you may want to have blue tinted as well as white roses in your bouquet. 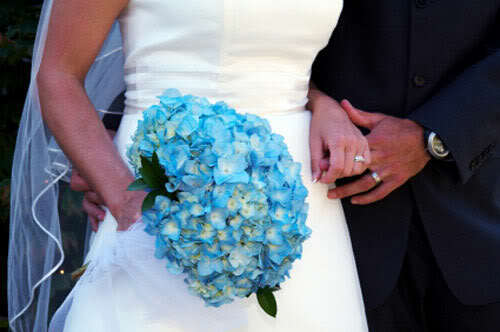 The first place you are going to want to focus on your wedding colors in the floral arrangements are the bouquets. You will carry yours down the aisle as will your bridesmaids. Besides the bouquet being part of the focus during the wedding march you will also have many photos with the bouquet front and center. 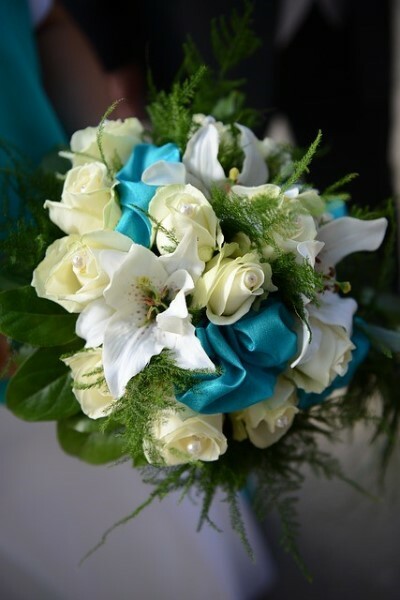 Many of your planned photos will include the bouquets. You and your bridal party will be holding them in the photos. 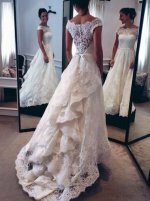 However, it is just as likely that you will have some artistic shots of the bouquets alone in your wedding album as well. With that being the case you will want to make sure they look exactly as you want them to look. How much blue will you use? 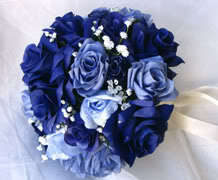 Will the entire bouquet be blue or will you use other flowers. 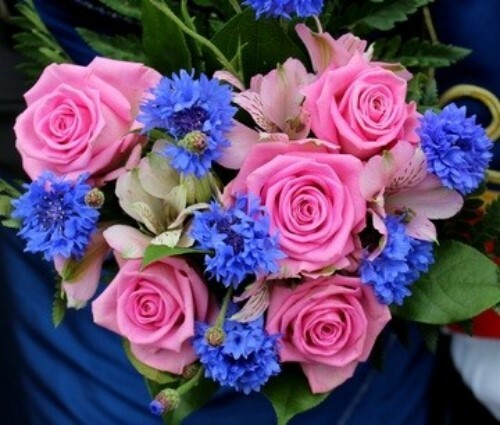 If you are using other flowers will they be white and cream colored or are you looking for something more dramatic like pink, yellow or red to mingle with the blue flowers. 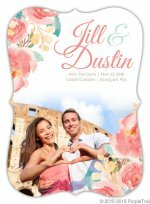 Besides the bouquets you will be carrying, you will probably also choose to decorate the wedding ceremony site and the wedding reception site with floral arrangements. 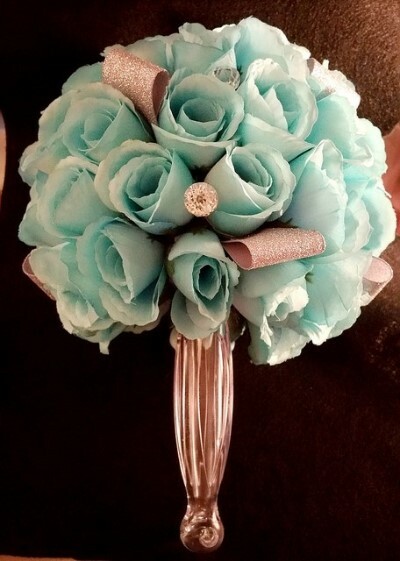 Most likely this arrangements will be similar to the bouquets in color and style, just larger or more elaborate. 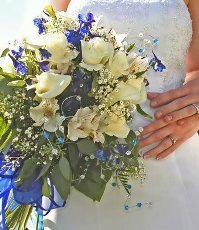 Some of the places you might have flower arrangements include the alter where you are getting married, at the beginning of the aisle that you will walk down, in the corners of the wedding ceremony site, at the entrance of the reception, on tables at the reception like the head table, the cake table or the gift table. Of course there are just few places you might put floral arrangements. How many floral arrangements you use is up to you depending on how many is too many for you, how much you like flowers and want to utilize them on your wedding day as well as your wedding budget because the cost of flowers can add up quickly. Finally the wedding centerpieces are traditionally a place where you could find flowers. Not everyone chooses to use flowers in their wedding centerpieces, the choose is yours. This is a place where you may want to be a little more creative in your choices and design. You could have tall, elaborate wedding centerpieces or ones that are have a more down to earth or even country feel. 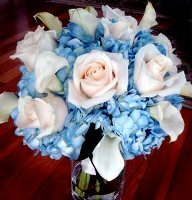 Flowers can be placed in crystal vases, mason jars or just about anything else that can hold them. You can choose to have overflowing bouquets or just a few blooms. The vase can stand alone or you might put it on a small mirror and pair the vases of flowers with candles and beads. If you like beads you might fill the vases with them or other design elements to make it really stand out. As I said this is where your creativity and vision will come into play. As far as the budget goes, yes the flowers will add an expense, but some of the extras can be bought on sale or in bulk to create the look you envision for less than you thought. If you come up with a design early enough you will have time to shop and find the best deals on supplies like floating candles, votive, mirrors, or beads. 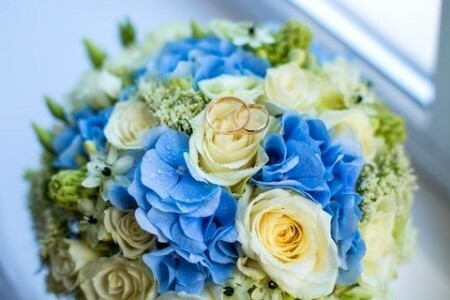 Blue Wedding Flowers - Which Flowers Are Available For Your Wedding? 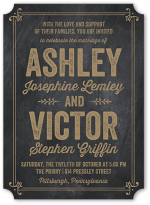 During the planning process you are probably going to want to narrow down your floral choices. 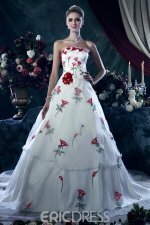 You will want to look for both flowers available in the season you are getting married as well as ones available all year long. There is no rule that you cannot use an out of season flower, but we must warn you if you choose to do this purchasing flowers out of season can raise your florist bill dramatically. I would suggest that you get prices for different flowers and combinations so when you make the final decision you can weigh how much you want to use a specific flower versus how much more it will cost than your other options. 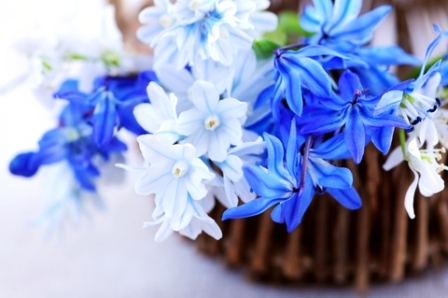 There you have it, a nice list of possible blue flowers for your wedding. 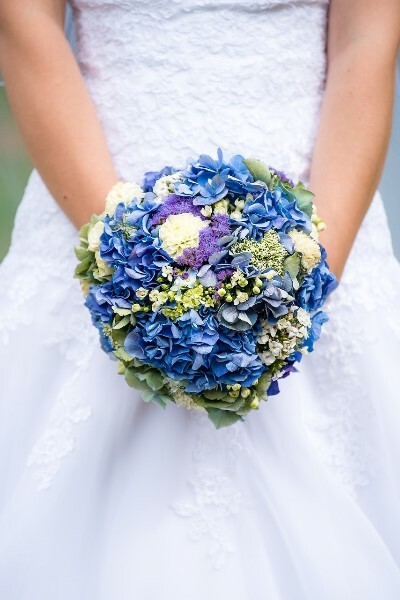 Many of these blue wedding flowers come in a variety of colors, not just blue, something to keep in mind when you are talking to your florist.